Repeat layers until you have desired amount and enjoy! This is a delicious recipe, shared with me by my dear friend, Lindsey Byers. Lindsey got this recipe from her college roommate, Jenni Cook Holbert, when Jenni's Mom and sisters would send it to them. Like I always say - share recipes, and they will last forever! Mix all ingredients in one large mixing bowl. Spray a 9x13 pan with Pam and pour the mixture into the baking dish. Bake at 350 degrees for 10 minutes and stir well. Continue baking for 10 more minutes. Feel free to add other ingredients such as dried cranberries or apples! 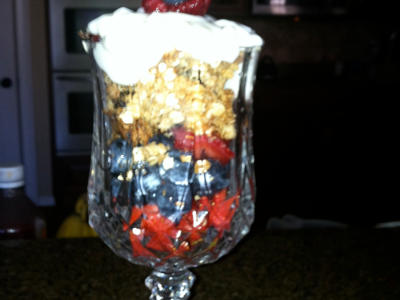 **When I made Lindsey’s (Lacey’s) granola, I added shredded coconut and dried cranberries! Store in an airtight container.